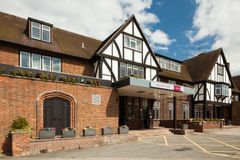 The 3* Mercure Leeds Parkway Hotel is nestled in the award winning, picturesque Golden Acre Park in the north west of Leeds. Situated 15 minutes from the city centre & with the Yorkshire Dales only 3 miles away you get the best of both worlds. 118 stylish decorated rooms are on offer to visiting golfers and all of them feature internet access, flat-screen TV and other modern amenities and comforts that will ensure a relaxing stay. Rooms range from Classic rooms to Superior Rooms and Privilege Rooms which boast garden views. Soak up the atmosphere in the hotels Brasserie restaurant where you can choose from a collection of mouth watering dishes prepared using fresh, locally sourced ingredients. To compliment your meal, choose from a fantastic collection of fine wines, from Australia to Italy there's something to suit every palate.